Jaguar Cars Ltd produced 350,000 cars from 1955-1980, and most of their proud owners almost certainly acquired beautifully crafted key fobs tailored to the Jaguar marque. But fewer than a thousand of these artifacts appear to have survived, and no living individual has ever seen more than a fraction of them. Jaguar enthusiast and researcher Bud Marston determined to assemble a collection of these old jewels and record his research and observations before their stories vanished with the passage of time. 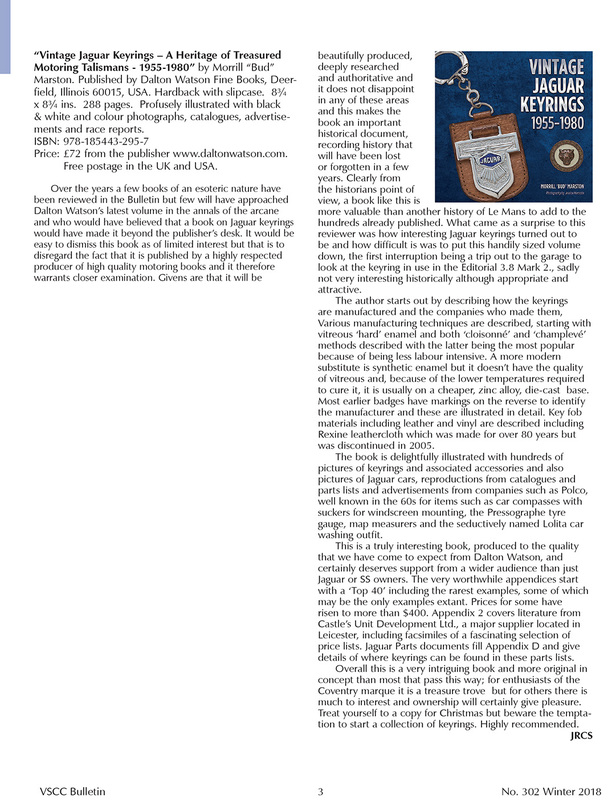 Almost no Jaguar literature mentions vintage keyrings, even though most Jaguar owners would have treated them as prized possessions. Marston spent years researching original primary and secondary sources in England, consulting with some of the world’s most well-known Jaguar automobilia and car collectors, and completing the largest collection of vintage Jaguar fobs in Europe or the United States. He then commissioned the noted jewelry photographer Jessica Marcotte to record more than 300 beautiful fobs on film; the results are spectacular. Vintage Jaguar Keyrings describes how fobs were fabricated in the first decades after WWII, identifies dozens of ‘makers marks’ found at badge reverse, and clarifies the progression of Jaguar fobs by the most important fabricator of the day. 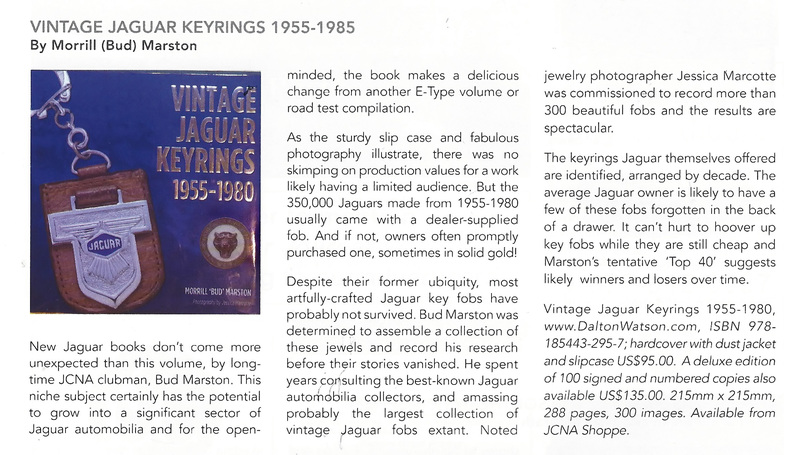 Marston devotes entire chapters to keyrings available in the 1950s, the 1960s, and the 1970s beginning with a short description of the business environment within which Jaguar Cars Ltd operated and sketches of the most important Jaguar models available in each decade. Every keyring offered in Jaguar parts manuals for every model between 1955 and 1980 is identified. This is a fascinating account of a niche in Jaguar history almost completely overlooked—the beautiful key fobs that accompanied Jaguar owners during a golden age of motoring. Well-researched by a long-time classic Jaguar car enthusiast and concours judge and lavishly illustrated with full-sized examples of more than 300 vintage fobs, the book reveals for the first time the wide array of Jaguar ‘optional extra’ and aftermarket keyrings that accompanied their owners down the road of life. This remarkable work promises to become the definitive source of information for classic Jaguar enthusiasts on the lovely vintage Jaguar key fobs available in the early post-war decades. Morrill 'Bud' Marston graduated from the U.S. Air Force Academy in 1970 and served in the Air Force for 30 years as a pilot and military attaché followed by 12 years in intelligence. In 2001, the Defense Intelligence Agency inducted Marston into its Hall of Fame for exceptional reporting on political-military affairs of strategic interest and relevance to U.S. national security. After retiring in Alexandria, Virginia, his focus shifted from flying and military diplomacy to classic Jaguar cars, including a 1961 E-type coupe that is now a Jaguar Clubs of North America (JCNA) National Champion. 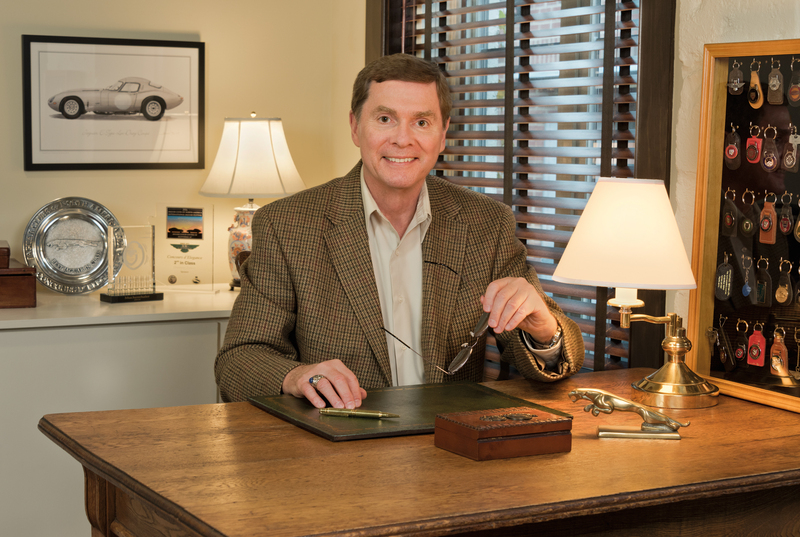 During the past decade, he has participated in numerous concours Jaguar shows on the East and West Coasts, both as a car entrant and as a JCNA-certified judge. Superb book, well written, good organization, stunning photographs, a great read for any British car enthusiast.